How often have you read a book that was life changing? You know that if you practice what it suggests your life will be better, yet somehow you forget. You forget to meditate in the morning. You forget that three breaths calm you down. You forget all the lessons you learned. Time for Me is different because it contains wisdom that really works. We have the ability to rewire and create new neural circuits in our brains, and the more we practice something new, the more we can form new neural pathways with each repetition. In time, these new pathways become deeper than the ones made by our old habits and they become automatic. That means, if we were to practice all this week thoughts such as 'I am happy' or 'I am calm', we would be more apt to return to them when we feel otherwise. Time for Me contains wisdom proven to be true, wisdom that works if you work it, wisdom that has been true over many thousands of years. It is said that there is nothing new under the sun.This really isn't true. Science is discovering new truths all the time. One of these discoveries just happened within the past forty or fifty years. It is the field of neuroplasticity or brain plasticity. It found that our brains are not hardwired, as it has been thought until very recently. Scientists have now proven that we have the ability to rewire and create new neural circuits at any age! The other part of this exciting news is that our thoughts can rewire our brain. While it was concluded that our brains couldn't change after we were in our thirties, we now know that our brains are like plastic and can continue to change over our lifetime. For example, the more we practice something new, new neurons fire together forming new neural pathways in our brains, deepening with each repetition. So if we were to practice all this week, saying to ourself 'I am happy,' or 'This is a happy moment,' or 'This is a peaceful moment,' or 'This is a calm moment,' etc., we would be more apt to return to this thought during moments when we are feeling otherwise. In time, these pathways become deeper than the pathways made by the old habits that we are no longer practicing, therefore becoming more automatic. Actually, the Buddha knew this 2,600 years ago. He simply didn't have the scientific proof. He discovered that our thoughts create our feelings. And he taught that if we change our thoughts we change how we feel. He didn't have scans and other modern equipment that could examine our brains to prove it. But he lived this truth and taught it and those who listened and practiced it displayed additional proof that this was true. This is why Time for Me is set up for us to practice every day, one subject, one week at a time. We practice each week to create new habits that will last us a lifetime! Buddhist monk, worldwide meditation teacher and author of more than fifty books Thich Nhat Hanh teaches about changing our habits in a very easy to understand way. He explains that within us are all the 'seeds' of all the characteristics that people have. He suggests we imagine that they are all stored in our basement. He calls the seeds that cause our suffering, such as anger, jealousy, and fear, the 'weeds,' while the characteristics that create joy in our lives such as compassion, generosity, and love, are the 'flowers.' The ones that grow are the ones that we water and they come up into our living room. It's up to us which ones grow. 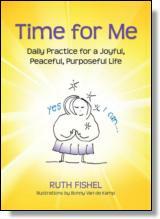 Time for Me is a personal practice book. It is not a workbook. It is laid out in a weekly form to be practiced daily. It is personal because if you accomplish the simple truths found in each section in less than a week, then you simply move on. If it takes you longer, you simply practice that particular lesson for as long as it takes. Only by being aware of our thoughts can we change them. You can call this God, spiritual energy, Higher Power, Buddha energy, Allah, whatever you choose to call a power greater than yourself to which you feel connected. Based on our new scientific understanding of neuroplasticity, we have the power to change our thoughts. ©2015 Ruth Fishel. All rights reserved. Reprinted from Time for Me: Daily Practice for a Joyful, Peaceful, Purposeful Life. No part of this publication may be reproduced, stored in a retrieval system or transmitted in any form or by any means, without the written permission of the publisher. Publisher: Health Communications, Inc., 3201 SW 15th Street, Deerfield Beach, FL 33442.